[13:24:10] <skunkworks> hmm - how do I get lstopo? [13:32:30] <skunkworks> makes sense as L2 is shared between 2 cores. [14:13:23] <skunkworks> I wonder how the rt_preempt would preform using those settings. [14:45:33] <skunkworks> Am I understanding it right? [14:50:33] <seb_kuzminsky> well, i agree with this statement: < skunkworks> makes sense as L2 is shared between 2 cores. [14:56:05] <skunkworks> ah. would these setting have any effect on rt_preempt? [15:09:36] <jepler> skunkworks: do you have a github account? [15:21:40] <skunkworks> I could play with that in the future. 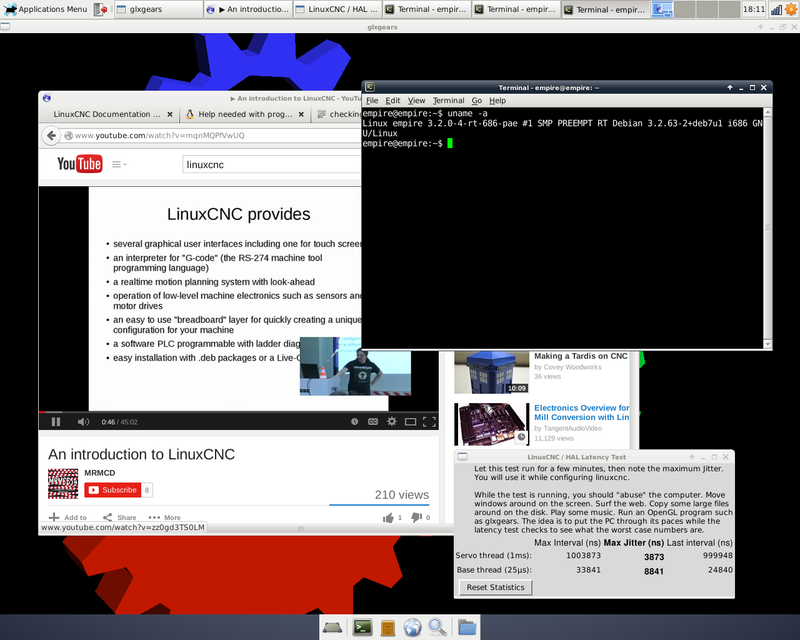 [16:16:14] <seb_kuzminsky> heh, "introduction to linuxcnc", "electronics overview for mill conversion with linuxcnc", "making a tardis"
[16:25:16] <seb_kuzminsky> skunkworks: is this your j1900? [18:25:34] <skunkworks> the_wench: where is your log? [18:47:05] <seb_kuzminsky> do you mean "idle=poll"? [19:22:16] <skunkworks> on what system? [19:31:38] <bjmorel_work> PCW: did you try the isolcpus on a 4-core? I could see it not having an effect on the 2-Core J1800 because of the shared cache, but it might work ok on the 4-core. [19:36:53] <skunkworks> I can play with it tomorrow..
[19:41:05] <skunkworks> the gigabit j1900's have 2 nics. [20:34:49] <kwallace1> In my opinion, that's a pretty darn nice board above. 2 x PCI, PCIe, a parallel port, serial port, HDMI, good latency and low cost (not too much more than a Beagle). I wonder why PCI (or parallel port) hasn't been killed off yet. I'm not a fan of Intel graphics, I wonder how well OpenGL gets along with this board. [20:39:50] <kwallace1> Offhand, is there a write-up on a hardware latency test?